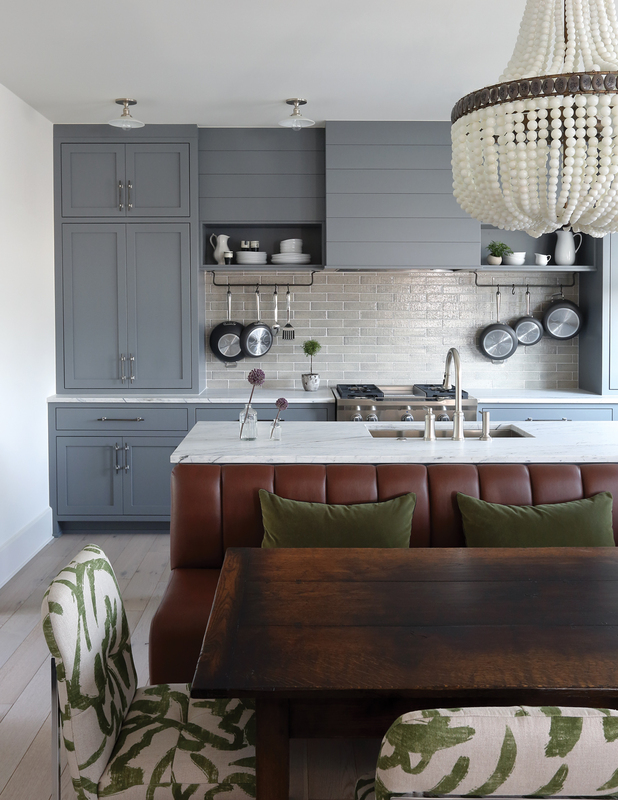 The cozy kitchen setup led to one knockout chandelier rather than typical pendants. This beaded number from Currey & Company makes a stately focal point. Reversing the trend of vent hoods that scream, “Look at me,” this wooden one is understated but clever, with niches on either side. Sessions chose white-oak floors in a nontoxic stain called “Salty Biscuit.” A touch of blue adds interest to gray cabinetry. Instead of using the countertop as a breakfast bar, Sessions designed this banquette. Faux leather from Designs by Sudi scores high for comfort and durability. An antique table brings a warm patina to the seating area, and vintage chairs with a midcentury vibe were recovered in a lively Zak + Fox fabric to keep the look fresh. Marry style and function with mounted pot racks. “I think hanging pots and pans sends the message that this is a working kitchen but still looks great,” says Sessions, who rents out this home through her boutique rental company, Hedgewood Stay.